Cost: $15 for members, $20 for non-members. Payusing Venmo or cash at the SWE Office. Introduce A Girl to Engineering day is an annual event put on by the Society of Women Engineers. We invite high school girls to come to the UIUC campus for the day to explore what it means to be an Engineer at Illinois. This year we will be exploring the stranger things about engineering and learning more about the world we live in! Thank you to everyone who was looking forward to the Back-to-School Cookout. As you all know, the weather was not in our favor that day. The Recruitment committee still wants to make it happen! So, rather than this being a Back-to-School Cookout it will be called the End of Summer Cookout. As always, free food and awesome company will be offered. Please RSVP to the event by Sept. 28th so we can make sure everyone enjoys enough food! Welcome back to another great year! SWE invites you to join us at our annual Back-to-School Cookout! Come out to meet new and old friends. There will be a very informal New Member Orientation during the event, so anyone is welcome come and learn more about the countless opportunities SWE has to offer. As always, free food and awesome company will be offered. Please RSVP here to the event by Sept. 7th, so we can make sure everyone enjoys enough food! Curious about learning all the leadership opportunities SWE has to offer? Come to the Committee Open House to explore the different committees within SWE, and talk to the committee directors about all of the committee chair positions offered. It is a great way to get involved early-on, and encouraged no matter what experience you have. Feel free to come and go, or stay as long as you would like. All attendees will have a chance to win one of three gift cards in a participation raffle! Cost: $15 for SWE/WCS/AOE National Members, $20 otherwise. Pay using PayPal below or with cash/Venmo at the SWE Office. Questions? Contact Amanda Hsu at achsu3@illinois.edu. 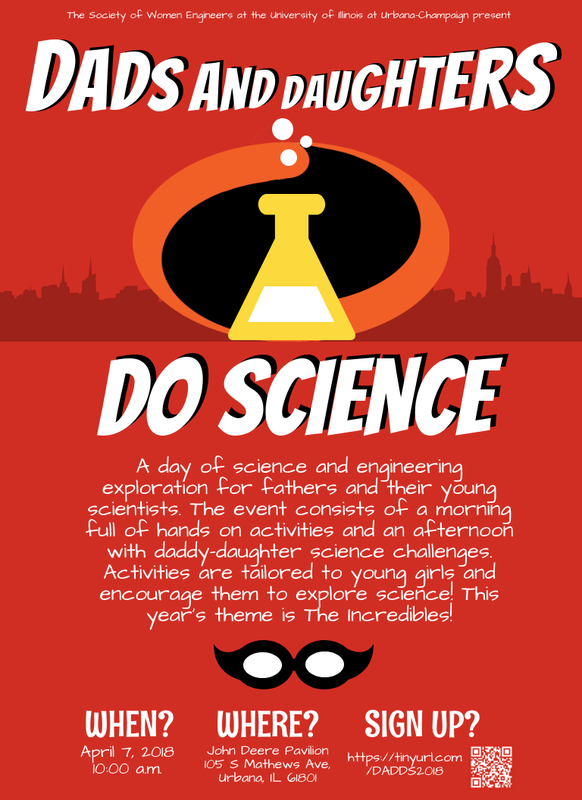 Dads and Daughters Do Science (DADDS) is a day of science and engineering exploration for fathers and their young scientists! This event consists of a morning full of hands-on activities and an afternoon with daddy-daughter science challenges. Activities are tailored to young girls and encourage them to explore science! This event is for girls 1st-3rd grade and their dads. The theme this year is The Incredibles! To register for DADDS, please complete the following steps before March 28th, 2018! 1. Please sign up using this form. 2. Please pay the $5 register at the PayPal link below. Join the Illinois Society of Women Engineers (SWE) for Little Sisters Weekend! At this two night event, female students admitted into engineering disciplines will have an opportunity to meet and room with a current female engineering student in SWE for the weekend. Activities include attending Friday's classes, previewing residence hall life, and learning about their area of interest from our students. Registration opens on February 2nd and closes on March 15th 2018. Please pay the $20 registration fee at the PayPal link below. You must complete both of these steps to be fully registered. Introduce a Girl to Engineering Day 2018 will be held on February 17, 2018 from 10am-3pm at the Loomis Laboratory of Physics. The event includes introducing high school girls to different disciplines within engineering by participating in a variety of engineering activities and a design challenge! This year, we will be focusing on the STEAM (Science, Technology, Engineering, Arts, Mathematics) movement, where the creative side of engineering will be highlighted. Come join us for a day of fun and excitement! To register please complete the following two steps in this order by February 9th, 2018. Note that we have limited spots for this event, so registration may have to close early if registration fills up. If that occurs, this page will be updated. Mommy Me and SWE is an event for 4th-6th grade girls and their moms to come explore engineering through interactive learning. How far will you engineer? Registration is now CLOSED. Please look forward to next year's Mommy, Me, and SWE. Come out to the Illini Grove (south of McKinley Health Center), Urbana, IL to kick off the school year with SWE! This is a great opportunity to speak to SWE leadership and learn how you can get involved. This will be an informal informational event, so come as you are. Lunch will be provided! Engineering is SWEet! 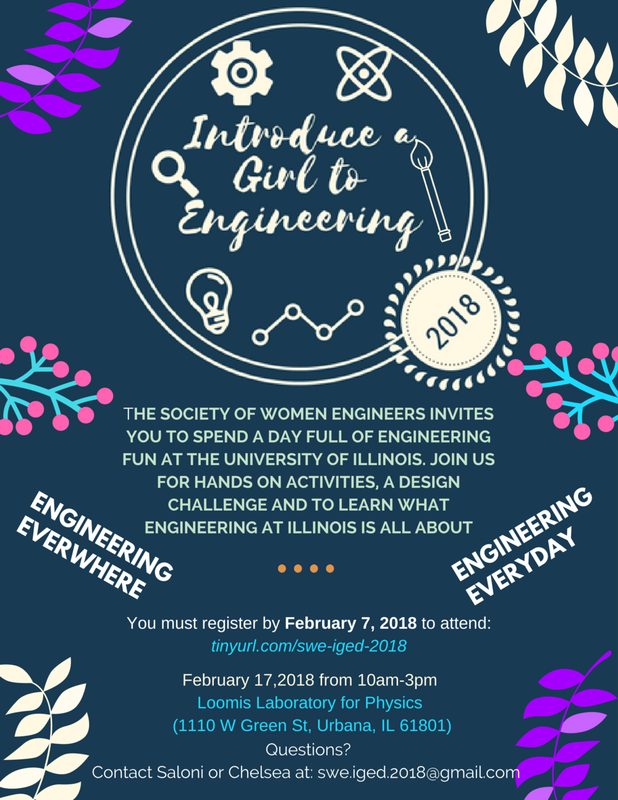 Come experience why through the University of Illinois Society of Women Engineers annual high school outreach event, Introduce a Girl to Engineering Day (IGED). This day will include inspiring speakers, innovative activities, and an interactive design challenge.